The seats went in on Friday. I finished the install at 9pm and registered for the two day autocross Sat-Sun. Both days featured sweltering heat and a pretty fun course layout. The new seats definitely grip me quite well and are nice and low in the car. 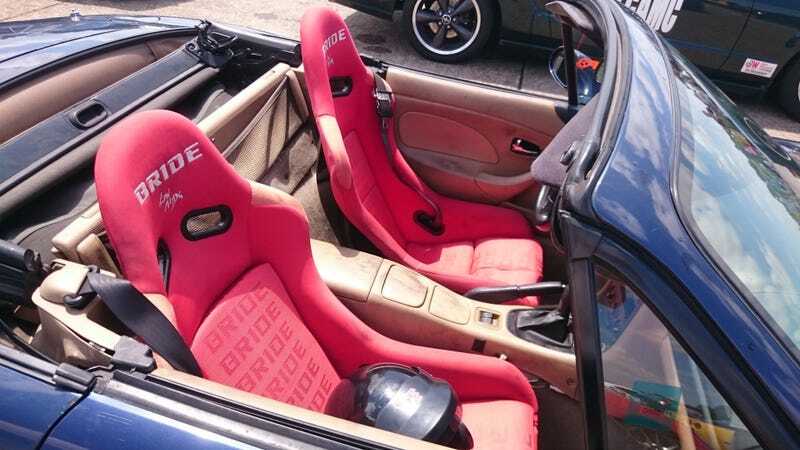 While of course they aren’t plush couch soft and comfy, they are pretty decent for full racing seats. Just using the OEM seat belts until I get a roll bar and harness. Plus they look sweet so I’m pretty happy. I may keep my stock passenger seat in the car so that people don’t hate being a passenger. But I will hang onto it for eventual track use with instructors. I’m hoping in general though that I’m going to be able to pass the broomstick test. I can fit in the car with the top up and helmet on with a couple inches to spare. So I think I’ll be okay. Plus there’s the removable padding so I can drop another couple inches. At the event, I came in first place in class... And last place. I was the only one in my class! Haha but I don’t mind, I got to go fast. I do autocross for fun, I’m competing against myself primarily. But it’s always fun to beat other people. Someday someone with a true CSP build will show up and destroy me by 3-4 seconds. Overall placing 54/134 in raw time ain’t too terrible. Especially considering the 15 or so karts at the top.